★"Sometimes, real superheroes live in the hearts of small children fighting battles"..
Ryan's Foundation lost an child last week, but gained an angel. Two and a half year old, Kordelia gained her wings. Ryan's Foundation paid for the funeral expenses for the family living in Hyde Park, NY. ★Last week, Ryan's Foundation was able to help a local Pawling Family. Joshua, age 14, was diagnosed with Hypoplastic Left-Heart Syndrome before he was even born. He has gone through 10 major surgeries, including his last one, a heart transplant. Many of us may know Joshua as a volunteer at the Pawling Fire Dept, or helping in the kitchen at Iron & Wine Restaurant. Joshua is a fighter. Ryan's Foundation paid for a water filtration system in their house to remove hazardous pollutants, making it safe for Joshua and his immune system, all installed by American Pump Service. We will continue to do whatever it takes to help children like Joshua and continue our mission to never say no to a child in need. ​​​​★Kayla from Monroe, NY is fighting through her third bout of leukemia. After have a transplant, she is fighting through treatment for the third time in her short life. Ryan's Foundation is paying for two months of car insurance for the family. ​​​​★Twelve year old Ryan from Walden, NY was just diagnosed with sickle cell disease and is going to be undergoing a bone marrow transplant. Ryan's Foundation paid the mortgage for the family, one less burden for the single mother to worry about. ​​★Ryan's Foundation helped pay the mortgage of a local family, living in Hopewell Junction. Their daughter, is suffering from Craniosynostosis, Crogan syndrome, and Arnold Chiari malformation. With very little mobility, getting outside of the house is almost impossible, therefore paying for their mortgage was just a simple relief we could take off their shoulders. ​"Dennis Patrick Gillespie was born four weeks early on July 12, 2004. Upon his arrival all seemed well. We were told he was healthy as they cleaned him, weighed him and whisked him away for his first bath. Not long after that he was moved to the pediatric ICU and the doctor explained that something was not right. After his bath he had turned blue and his color was not returning. A few hours later we met Dr. Michael Snyder, a pediatric cardiologist who informed that our son was born with a complex congenital heart defect called Tetralogy of Fallot which causes oxygen-poor blood to flow out of the heart and into the rest of the body. Our newborn would need immediate open-heart surgery. By the time Dennis was 7 months old, he had endured three open heart surgeries and numerous procedures. Previous to Dennis’ arrival, I was working as an elementary teacher in NYC. Hindsight really is 20/20 because when I first started and filled out the paperwork for my health insurance, I remember there being an emergency rider that I didn’t think was necessary as I was young and healthy at the time. Big mistake! Fast forward to the medical bills piling up, harassing phone calls from bill collectors, and my anxiety increasing daily. Edward, husband and father extraordinaire, had always been the calming influence in my life and now was no different. “They can’t get blood from a stone,” he told me. “All that matters is his continued good health, if we have to pay them $25.00 a month for the rest of our lives then so be it.” He was right. We sat down and began to look at where we could cut back in our budget in the hopes of arranging a monthly payment that both we and the hospital and could live with. I had joined a gym recently with the best of intentions. I would work off all my baby weight and be back to my old self in no time! Of course, this was before our world had been turned upside down. I also knew that breaking a gym contract would not be easy. I walked in holding numerous folders stuffed with bills and letters under one arm and my beautiful 9-month-old son in the other. The woman behind the counter did not break into the forgiving smile I imagined she would after I babbled at length about why I could no longer pay my gym membership. Instead she simply asked me to wait there. She returned with a rather large gentleman. I was confused. He introduced himself and his coworker as Chip and Judy McElroy. “We run a foundation” he told me, “in memory of our son, Ryan.” I didn’t understand. Who were these people? Why was I crying? After listening to Chip share Ryan’s story, he said, “We will take care of everything.” And they did. It’s as simple as that. It’s hard for me, even now almost 12 years later, to put into words how these amazing people changed not only our lives but our perspective. 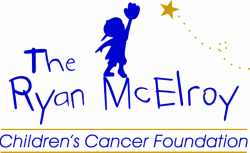 The Ryan McElroy Children’s Cancer foundation will ALWAYS be a gift from God to our family; and we are now, as we were then, forever grateful." ​★Being miles away from home, in another state, with your child is not easy, and certainly not any easier during the Holiday Season. A family living in the Mid Hudson Valley, whose daughter underwent a liver transplant, is currently still in Boston due to severe rejection and ineffective steroids. To make this is a little less stressful, Ryan's Foundation has paid and will continue to pay for the hotel accommodations for as long as the family needs while in Boston with their daughter. ★A family we have been helping for several years whose son suffers from Hodgkins Lymphoma is going in for radiation therapy for 3 weeks. Ryan's Foundation just paid their Central Hudson bill, as well as gas cards to make their commute from Newburgh to Westchester that much easier. We are praying for this family and child. Keep them in your thoughts and prayers. ★Meet Jonathan. A 16 year old boy who was diagnosed with Arthrogryposis Multiplex Congenita, Pierre-Robin Syndrome, and was born with multiple severe skeletal deformities and severe Respiratory Distress Syndrome. Jonathan's doctor recommended that he continued his physical therapy exercises outside of PT, which would require an Adaptive Tricycle. Over the summer, Ryan's Foundation was able to provide Jonathan with this Tricycle, in his favorite color blue, so he can move towards ambulating more independently and become less dependent on assistive equipment. God Bless Jonathan and his family! ★A family living in Poughquag NY has a 4 year old little girl recently diagnosed with hepatoblastoma and has to have a liver transplant. They are traveling to Boston this weekend to see about the prognosis. Ryan’s foundation paid for their hotel stay while in Boston. One less worry and financial concern the family has to deal with. Ryan’s foundation will do whatever it takes, at any hour, at any moment, because every second matters. God bless this family and little girl and know we are here, no matter. ★ Ryan's Foundation helped a family, living right in Poughquag NY, whose 3 year old daughter was just diagnosed with Hepatoblastoma. After medical bills started coming in, the family's mortgage was just one of the many bills they couldn't afford, but could not not pay it. Ryan's Foundation was able to pay the family's mortgage bill; one less thing for the family to worry about. ★Sometimes, insurance companies can go only do and cover so much. Sixteen year old from Walden, NY is suffering from Hodgkins Lymphoma. After chemotherapy and radiation, she had to proceed with physical therapy to fully be able to recover and have the motion and strength she once had. With session after session, insurance could no longer cover the physical therapy for the child. With no where near completion of treatment, we could not let this be the end. Ryan's Foundation helped pay for the physical therapy in order for her to fully recover. Life is too short, each day goes by too fast, continue to pray and hope for a new day. Please keep her and her family in your thoughts and prayers. Ryan's Foundation will do whatever it takes to help save the life of that child. ★ ​Today Ryan’s foundation helped 3 year old La’Nova. La’Nova was born premature and her lungs were not fully developed, making it hard for her to breathe on her own. At 3 months old, she was given a tracheostomy to breathe reliably and a g-tube in her belly for feeding. At 2 years old, she began to learn sign language. Now at 3 years old, she has physical restrictions and is completely non verbal. La‘Nova is scheduled to have reconstructive surgery on her airways and eyes at The Children’s Hospital of Philadelphia. We hope and pray for La’Nova and her family as they travel and prepare for surgery. Whatever we can do to help save the life of that child and in this case, help make sure La‘Nova can be trach-free and have a voice. ★ Meet Deskin. He just turned 5 years old. Ryan’s foundation helped Deskin and his family when he was first born by installing an automatic generator in their house. Deskin’s medical equipment is hooked up to the generator, therefore Deskin is never without his medical equipment, with or without power. On this snowy day, Ryan’s Foundation just received a message from Deskin’s mom, thanking us for the generator as their power just went out. After 5 years, we are so humbled to be able to continue to help this family and continue to give them hope. God bless. ★ Ryan's Foundation just paid a Central Hudson Gas and Electric Bill for a family living in Fishkill, NY whose daughter, just eight years old is suffering from Pre–B cell acute lymphoblastic leukemia. No family should ever have to go without electricity, but especially in a time where the focus is on saving their child's life. ★Ryan's Foundation bought an Adaptive Rifton Tricycle for a sixteen year old boy in Poughkeepsie, NY who is suffering from a multitude of illnesses, including congenital musculoskeletal deformity of the spine. The Tricycle will allow him to continue exercise and movement, as well as independence. Whatever we can do to make a difference, we will. ★Ryan's Foundation purchased two tumble form rolls and a customized Postural Support System for a little boy living in the Mid-Hudson Valley. ★Ryan's Foundation is able to help a single mom whose child is currently suffering from Ewing Sarcoma. Sending a direct check to the mom to help her pay everyday bills, medical bills, is why we do what we do. No one understands the burden of bills until you have medical expenses that you can't keep up with and a child who is fighting for their life. ★Being able to help a single mom, whose child who is currently at Maria Fareri Children's Hospital, is just one of the reasons why we Never Say No. Being able to help her with food and necessities, while her child is fighting, is just one of the reasons why we Never Say No. ★Ryans foundation paid for a car payment for a mother whose child suffers from seizures. Whatever we can do to help relieve the stress and burden for a family, we will do. ★Ryan's Foundation was able to help a family whose 8 month old baby, currently at Maria Fareri Children's Hospital, has Shwachman Diamond Syndrome. The mother needed a new adjustable stroller to try to sit up more and a bumbo seat to enable her to gain strength to sit up more. Whatever we can do to make a difference in the life of a child and the family. ★A beautiful message we received from a mother whose daughter has been fighting with cancer for 4.5 years. We want to be there for the child and family, no matter what. We don't want them to ever worry, question where to turn, or hesitate to ask for help. We are here for you. God bless! "On January 19, 2013 life as we knew it changed. At the time I never thought it would be a good change. As horrible as it is to hear the words "your child has cancer", this journey has come with a lot of positive outcomes. My daughter continues to fight this beast with the same attitude as she began fighting with, 4.5 years is a long time to keep such a great attitude when things are rough! We have had so many amazing people come out to help us, cooking, fundraising, just being available for whatever and the prayers from near and far have helped us to keep this positive outlook overall. There is one foundation that has stuck by our side from the start and initially reached out to us, we didn't even go to them! The call was something like "We heard the news about your daughter and we would love to help you in any way we possibly can".... well it has been a long 4.5 years but I cannot express how grateful we are and how blessed we feel knowing you are on our side and on the sides of so many families dealing with illnesses. There is no question about it... you guys (your team, family, friends) are truly amazing people who have become the sunshine on our cloudiest days. I don't know when we will be able to "give back" but we sure hope it is a lot sooner than later. Thank you The Ryan McElroy Foundation." ★ Ryan's Foundation will be paying for Physical Therapy for a young girl who just finished radiation. Suffering from Hodgkin's Lymphoma and several weeks of radiation, physical therapy is a pivotal part of recovering from severe leg weakness for her to get through each day. We will do whatever it takes to help that child and the family. ★To be able to help and alleviate any stress for the family with a sick child, is what we are here to do. Being able to pay rent for a mom whose three year old daughter is fighting for her life with medulloblastoma is what we are here for. Anything we can do to help save the life of that child and taken some of the stress of the parent's shoulder is our mission. ★Ryan's Foundation just paid for hotel accommodation and transportation to and from the hospital for a 14 year old girl suffering from Hodgkin's Lymphoma, who is going through three weeks of radiation. Traveling over an hour away was not an option, therefore Ryan's Foundation was able to cover the cost to make sure that child is receiving everything possible to make it through everyday. ★ Ryan's Foundation was able to purchase a TV for a child who is suffering from a brain tumor. Whatever it takes to help that child overcome the day to day struggle and get through everyday is our mission and will never say no. ★Ryan's Foundation just ordered a new mattress and box spring for a family living in Poughkeepsie, NY whose home was unfortunately, infested with bed bugs. This child is suffering from a brain tumor, fighting each day. Whatever we can do for a family in need, we will do. ★Being able to never say no to a family and child with a life threatening illness is our mission. To be able to do whatever we can; financially, physically, emotionally is what Ryan's Foundation does. To never let a parent of a sick child think of the questions; would have, could have, or should have, is our job. Ryan's Foundation will do whatever it takes to save the life of that child. Today, Ryan's Foundation was able to write a check to a single mom whose daughter has Ewing Sarcoma. Ryan's Foundation is here to try to alleviate that mom of the current medical and non-medical bills pouring in. Never do we, Ryan's foundation and Ryan's family, want to have a parent worry about what to do next, where to turn, and how to pay for all the expenses. As a parent, your only thoughts should be on your child. That is where Ryan's Foundation come in. If you know of a family and child who is suffering from a life threatening illness, please contact us. "Thank you for your call today, it sometimes feels we're alone and adrift at sea, but to know you are there to help us find the shore, eases my heart & mind. I know there are rough waters ahead for our family, and hopefully we'll get our bearings back soon, to get my son back on course for a better out come for his overall health and wellbeing". God bless this family, child whom is suffering, and all the children and families fighting everyday. Ryan's foundation is here and will do whatever it takes to help. ★ Ryan's Foundation was able to help pay for car expenses for a mother whose 7 year old boy who is suffering from cancer, traveling back and forth from Fishkill to Maria Ferrari Children's Hospital. ★ ​Ryan's Foundation just paid for a mortgage bill for a mother and her daughter, living in Poughkeepsie, NY. Her daughter is five years old, suffering and fighting against a brain tumor. We pray for this family and young girl as they battle each day. ★ A mother living in Millbrook, NY lost her husband in a fatal car accident, with two of their young children in the car. Luckily, both survived, but one is suffering with a multitude of life threatening injuries. A therapeutic hot tub was recommended upon the doctors and physical therapists, in order to stimulate the little girl's bones and muscles. Ryan's Foundation contributed towards their goal of receiving this hot tub for this tough two year old fighting for her life. We will continue to fight until this little girl has the hot tub she badly deserves and needs. ★ A four year old little boy with sickle cell disease is on a compounded medicine and needed it shipped to his house immediately because the family does not have the means of transportation to get to the pharmacy. Within a matter of minutes, Ryan's Foundation was able to pay for the medicine to be shipped directly to their house for the child. We hope to take that little burden of stress off of the parent's shoulders and help in anyway possible. ★ Ryan's Foundation just paid for new tires and supplied gas cards for a family whose 6 year old son was diagnosed and is suffering from Stage IV Neurblastoma, traveling back and forth to Maria Ferrari Children's Hospital. Whatever it takes to alleviate any stress, we will do. ★ Ryan's foundation paid rent and Central Hudson bill for a family living in Poughkeepsie whose daughter suffers from seizures and is now suffering from severe burns in the Westchester burn unit. We pray for this young girl and family. ★Ryan's foundation purchased a special needs car seat for a child who was diagnosed with Congenital Hydrocephalus, Cerebral Palsy, Epilepsy, Lennox-Gastaut Syndrome, Asthma and GERD. Whatever we can do to help this family and child, we will do. ★Ryan's Foundation paid for a Bottini fuel bill for a family living in Hopewell Junction whose son was born with premature lungs and is living on a generator. Whatever we can do to help this family during this difficult time, we will do. ★One of Ryan's children recently relapsed from Ewing sarcoma. Ryan's foundation has helped this family previously and on this Sunday, Ryan's foundation just met with the daughter's mom to help offset some of the medical expenses. We are praying for this young girl who has fought so much of her life against this horrible disease. Ryan's foundation is praying for you! God bless! ★We are pleased and so incredibly happy and blessed to say that Ryan's barn is now handicapped accessible! Thanks to all those who got this done and to Stannah Stairlifts for the installation! Ryan's barn is a dream come true and to say we are handicapped accessible is absolutely amazing. We could not be more proud of Ryan's barn and the amazing steps forward it is taking thanks to the generosity, help, and dedication to Ryan's Foundation and the children! ​★ Ryan's Foundation just paid for the mortgage for a family living in Kingston, NY whose daughter has inflammatory myofibroblastic tumor disorder; this is a life threatening disease which causes extensive tumor growth throughout the body. We are happy to help in anyway, and alleviate any stress and burden, during this difficult time. Our thoughts and prayers are with you. ★Ryan's Foundation just paid for a family's mortgage whose child recently underwent a bone marrow transplant from Clinton Corners, NY. After paying for medical bills and their child undergoing surgery, their mortgage was the last thing they were thinking about. Ryan's Foundation took that burden off their shoulders. ★Ryan's Foundation had one of our first families at the barn on August 26th! Fallyn got fitted for her new wheelchair with her mom, Bridget, her nurse, Cindy, and her physical therapist, Ann. Big thanks to Home Health Pavilion for the amazing customized wheelchair for Fallyn! Such an amazing morning! ★ The Dumas family came out to Ryan's barn August 14th to present Ryan's Foundation with a check from their son's birthday party last week. In lieu of gifts, Gavin wanted to have donations made to Ryan's foundation. It takes a special family, a special little boy to want to give back in such a remarkable way. He first found out about Ryan's foundation at the Dutchess County Fair, where he got his first Ryan's t-shirt, as he is wearing in the picture. Ever since that day, he wanted to give back and help kids. After his birthday party last weekend, he is making a difference in the life of a child! Thank you Gavin and thank you to the Dumas family! ★ Ryan's Foundation purchased a custom pediatric stroller for a 15 year old with adrenoluekodistorphy (ALD), a degenerative disease, so that he can more easily go outside for walks. ​★ Ryan's Foundation provided gas cards for a family staying at Maria Ferrari for 2 weeks so that dad could get back and forth from work up in Dutchess County. ★ Ryan's Foundation provided food cards to a family staying with their child at Maria Ferrari who had rushed down to the ER without any money for expenses.